The GPS device giant has a few big questions to answer for investors in its upcoming earnings announcement. GPS device specialist Garmin (NASDAQ:GRMN) will announce its third-quarter earnings results on Wednesday, Oct. 31. As it happens, that's the same day rival Fitbit (NYSE:FIT) is scheduled to post its results for the period. Fitbit is likely to trumpet the latest sales figures for its new Versa smartwatch, which has so far been a hit with wearables fans and has outsold Garmin launches. 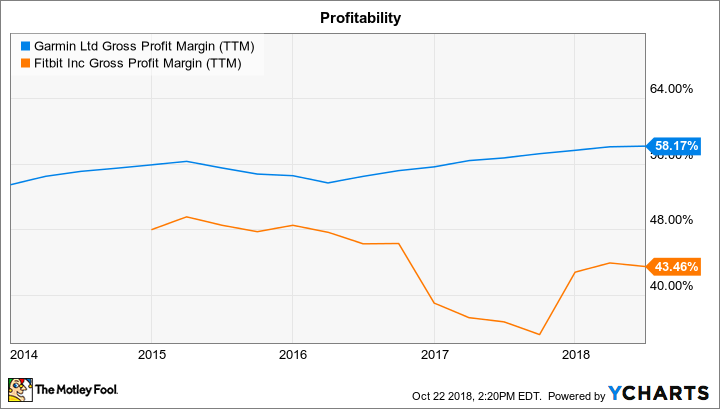 Yet Garmin will probably have the better overall report for investors when it comes to core growth and profitability metrics. Garmin's sales growth pace slowed in the most recent quarter, falling to a 4% uptick overall compared to the prior quarter's 11% boost. Its smartwatch segment hardly grew despite new launches in its fenix franchise, in fact. In its second-quarter earnings report, Fitbit noted that its new Versa device outsold fenix, and many other large rivals, in the preceding three months. However, Garmin's overall portfolio is performing better as consumers gravitate toward more sophisticated fitness trackers. Its 4% sales growth compares well to Fitbit's 15% decline, and that success has a lot to do with its much more diverse product line, which includes high-end health trackers in addition to hiking GPS products and devices used in boating and aviation activities. That broader portfolio should allow Garmin to report a sales boost for the quarter while most investors are expecting a minor decline from Fitbit. Garmin enjoys stronger profitability than Fitbit, and that gap should continue widening through fiscal 2018. Gross profit margin has improved by a full percentage point so far this year -- to 59% of sales -- thanks to a packed pipeline of innovative product releases across Garmin's fitness, marine, and outdoor segments. Fitbit has also seen its average sales prices rise as its sales mix shifts toward high-margin devices and away from cheaper activity trackers. However, its gross margin is still stuck at just 44% of sales. GRMN Gross Profit Margin (TTM) data by YCharts. Garmin executives lifted their earnings guidance back in August, and they now see operating margin rising to 21.5% for the full year, while gross profit margin improves to 58% of sales from 56% last year and 55% in fiscal 2016. Look for more progress toward that goal in Wednesday's report. CEO Cliff Pemble and his team said in their last earnings call with investors that they were seeing healthy demand from retailers in key product categories, and that gave them confidence to push up their sales guidance for the year. Those sellers have likely already made their biggest purchase commitments in preparation for the upcoming holiday season crush, which means Garmin should have a good view into where sales will end up for the year. As it stands now, the company is predicting overcoming another year of falling demand for its automotive GPS products through sharp rises across its other portfolio niches. Overall, sales should rise by 6% to $3.3 billion, while gross and operating margins both improve. Its actual results could stray from those targets, of course, but that's a much lower risk for Garmin than it is for Fitbit, whose 2018 results will largely depend on how well the Versa lineup performs during the critical holiday shopping peak.